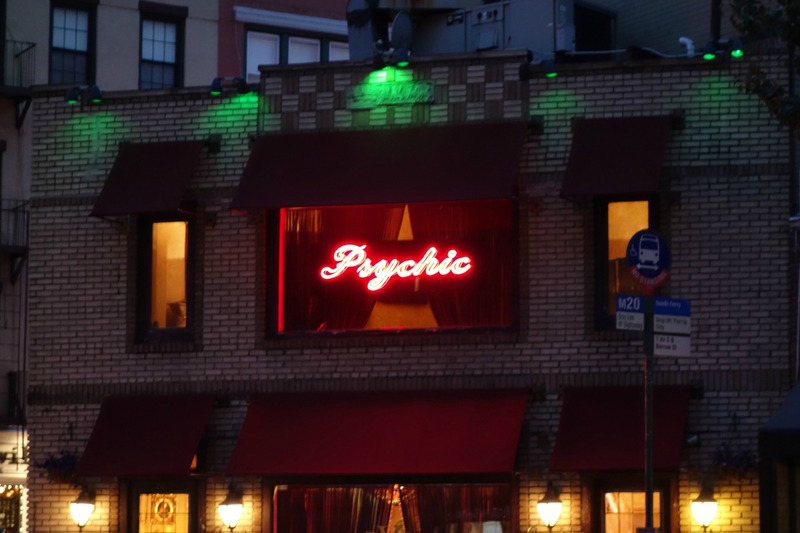 Neon and New York City had their ups and downs over the 20th century, from the glowing signage being an innovative advertisement in the 1920s and ’30s to already telegraphing seediness with its flickering in the 1940s and ’50s. Neon has had a resurgence in signage for fashion boutiques that are banking on that visual nostalgia, yet the actual historic signs are disappearing. When an old business moves out, their decades-old neon often goes, too. 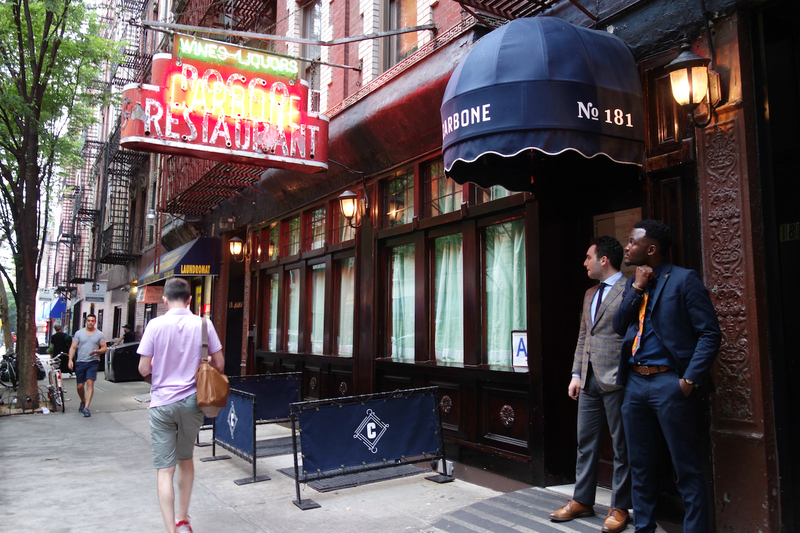 “I wanted to go photograph them while they were there to photograph,” said Thomas E. Rinaldi on his July 7 walking tour of neon in Greenwich Village organized by Untapped Cities. 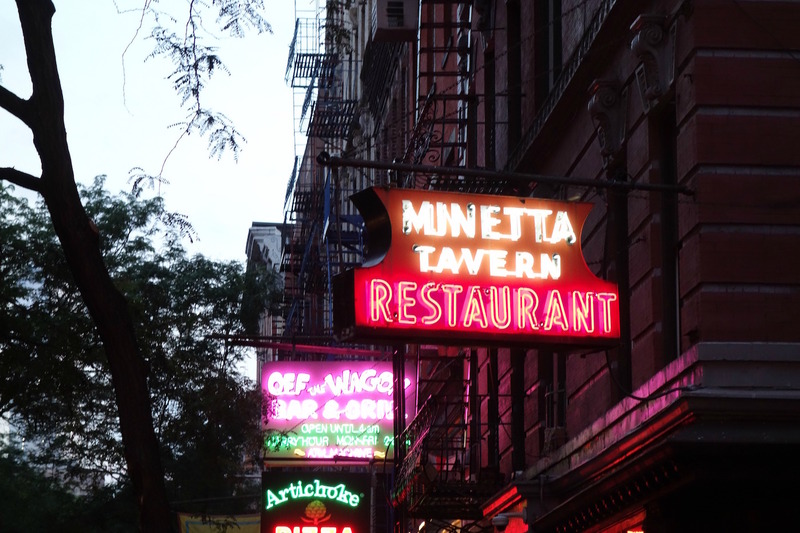 Rinaldi has spent years researching neon and journeying around the five boroughs to find the oldest surviving signs, which were sometimes already gone between when he spotted them on Google Street View and arrived at their location. 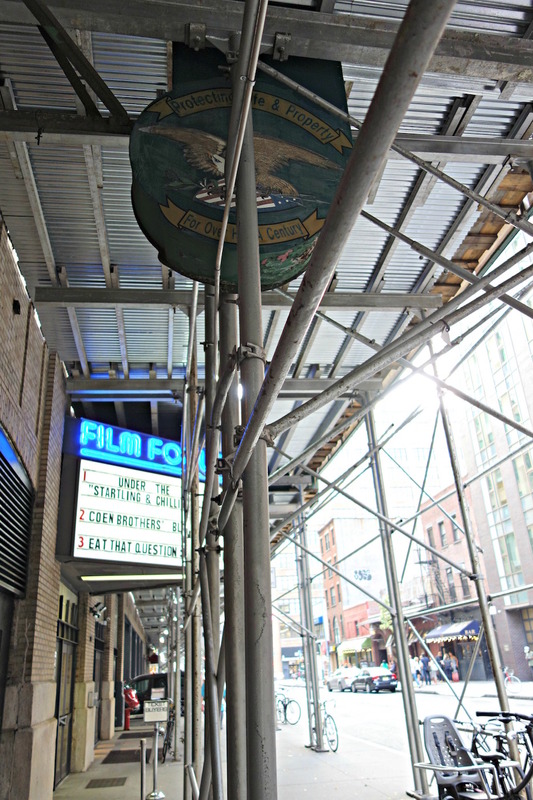 Our tour started outside Film Forum on West Houston (which has its own newer neon), where a 1930s metal neon sign that’s now covered with an advertisement for United Alarm Systems just had its tip visible through scaffolding. 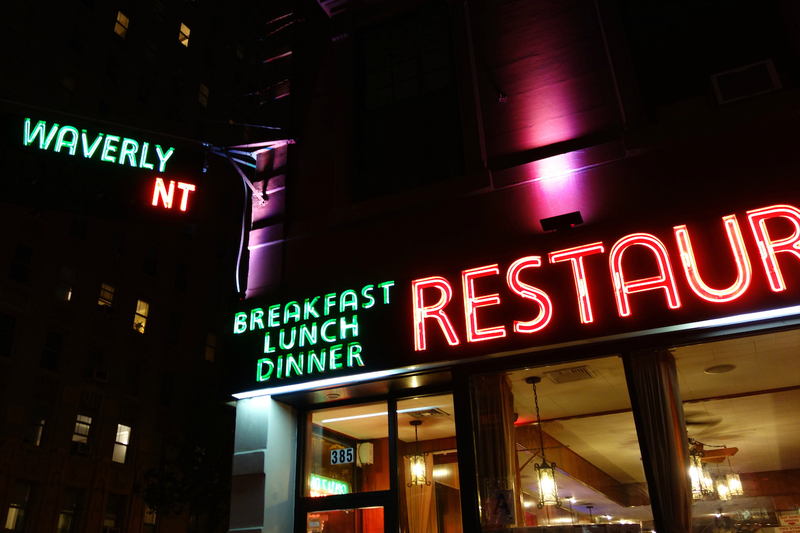 In 2012, Rinaldi published New York Neon with W. W. Norton & Company. 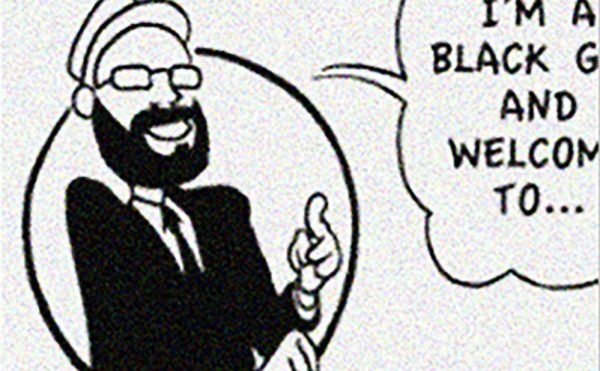 He also runs a blog of the same name where he shares upcoming tours (next is September 21) and recent discoveries, such as the drugstore signage by designer Charles J. Klein, and losses like the old Shore Theatre sign on Coney Island that was damaged during Hurricane Sandy in 2012 and later removed, or the animated Colony Records sign at 49th and Broadway removed in 2004. Others just extinguish and are never repaired, like a time and temperature sign we visited on Sixth Avenue that hovers darkly above the entrance to a Bank of America. He adds that those signs all vanished rather recently, between 2002 and 2005. 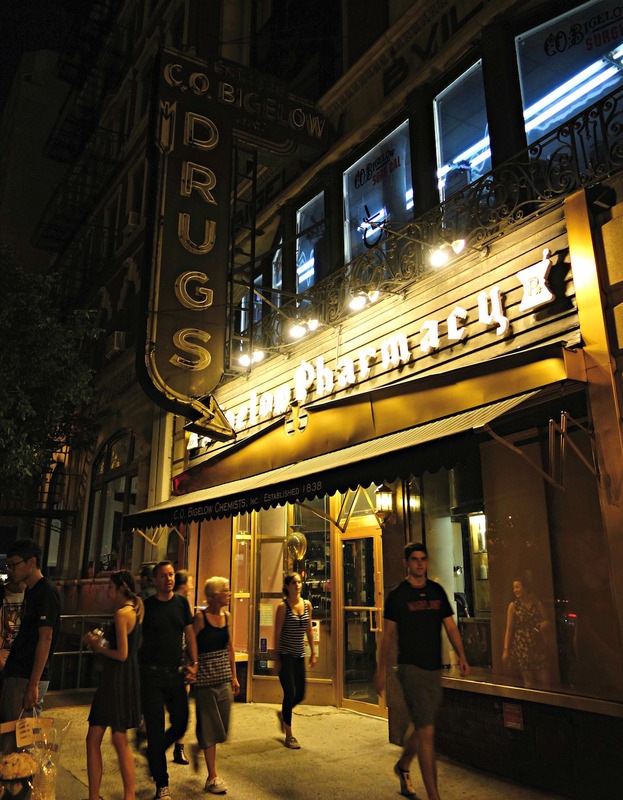 Landmarking is often not straightforward for neon, even when it’s historic, as the ownership by the building or the business is sometimes unclear. There are exceptions, such as the 1930s Pepsi-Cola sign in Long Island City which received landmark status earlier this year after being considered by the New York City Landmark Preservation Commission for nearly 30 years. Neon was discovered as a gas in 1898, and researchers found it glowed red when in a vacuum-sealed tube. In the 1920s, almost all the neon signs were this radiant red, although some were blue and actually contained argon. Later, phosphorus-coated tubes allowed a rainbow of hues. 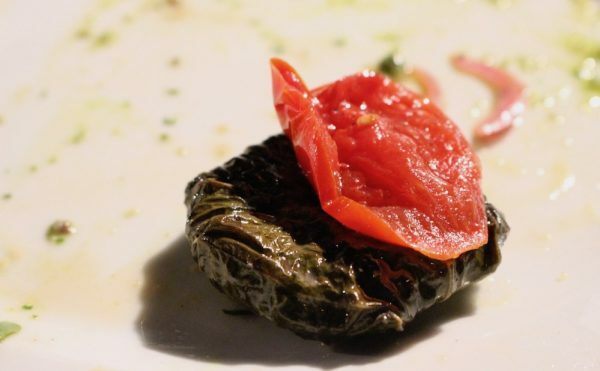 For aficionados there’s a lot of love for the clear red and blue where the dynamic nature of the gas is more visible. Zoning changes in the 1960s that limited protruding signs, as well as the expense of maintenance, caused neon to fall out of favor. However, it had already taken a character hit when author Raymond Chandler emphasized it as a tawdry setting in his 1940 Farewell, My Lovely, and film noirs in the same era regularly had signs illuminating streets prowled by femme fatales and hard-boiled detectives. “There were neon signs for churches before there were neon signs for bars,” Rinaldi explained, but the connection between neon and seedy nightlife was set. 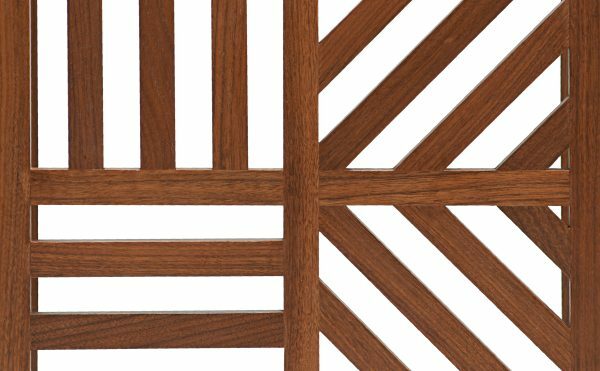 In more recent decades, cheaper signs like LEDs continue to replace the remaining labor-intensive examples. 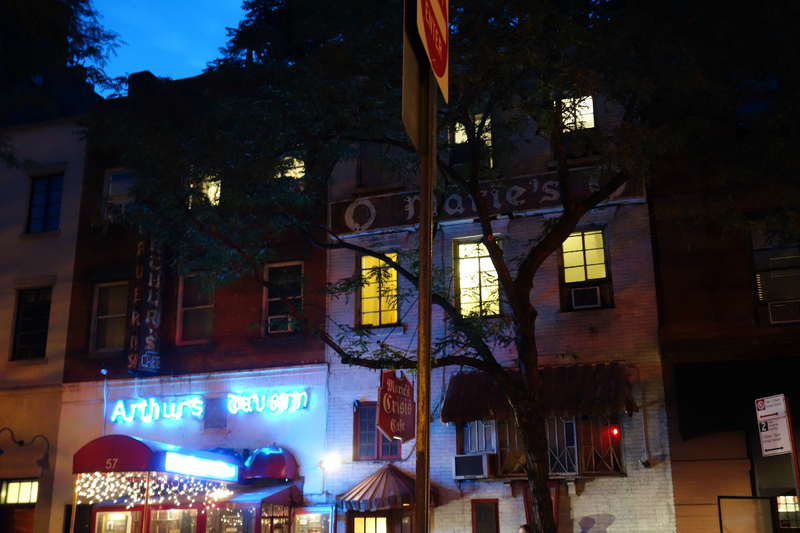 The closest you can get to the neon-packed commercial zones of early 20th-century Manhattan is MacDougal Street in Greenwich Village. 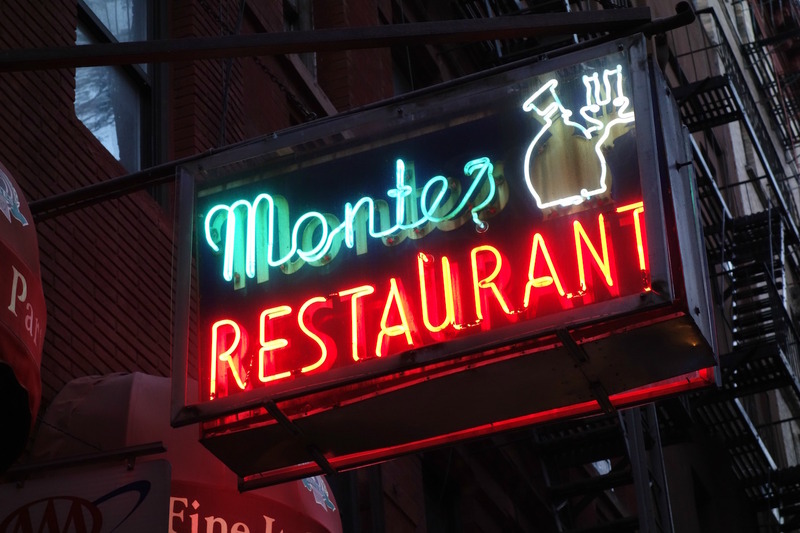 Signs like the one for Monte’s Restaurant that dates to the 1950s, with a rare figurative work depicting a chef holding a steaming bowl of pasta, mingle with newer illuminations that contribute to the atmosphere that has long been associated with the area. (Jack Kerouac in one of his author portraits was photographed in front of the Kettle of Fish neon sign on MacDougal.) 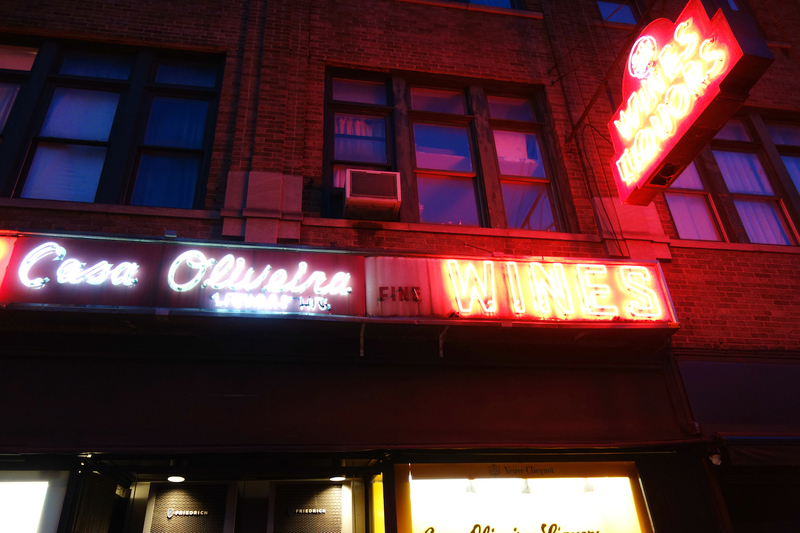 New York City has never had the elaborate neon of Route 66 or Las Vegas, yet surviving signs often indicate a local business that has endured through decades of urban change. New York Neon by Thomas Rinaldi is available from W. W. Norton & Company. 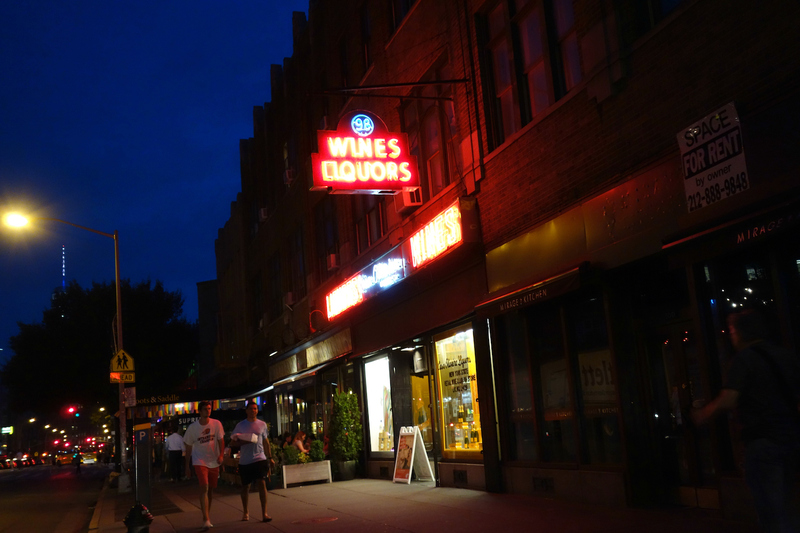 The next Greenwich Village neon tour is on September 21.